Our cities grow larger and more densely populated, while access to locally grown foods becomes more difficult and raw foods are transported greater distances. Urban centres have become a spaghetti of roadways filled with cars, buses and other forms of transport, as our remaining open spaces. This has contributed to the urban heat island effect, caused by extensive use of hard and dark absorptive surfaces, which has become a 21st century problem for cities worldwide. With increased temperatures and extended hot weather periods, built-up urban areas – particularly city centers, experience higher temperatures with extended hot periods, causing discomfort and occasionally deaths. Australian cities were planned with gardens allocated at city center fringes however these lawn areas with minimal tree canopies are rarely within the city center. While community gardens have cropped up in outer urban and coastal townships, there is a lack of garden planting in and around our city centers. Through ‘urban agriculture and social garden spaces’, the community can develop greater access to edible landscaping, and garden spaces, while combatting the urban heat island affect through tree canopies and vegetated areas. The City of Melbourne’s ‘Postcode 3000’ initiative, utilised an over-supply of office space in the central city during the 1990s to lead a resurgence in inner-city living, with the central city’s population more than doubling since 2001. In conjunction with the ‘Postcode 3000’ initiative, the council implemented a program of new tree plantings within the inner city to improve city living and humanise urban places. Tree canopies provide shelter in urban areas and cool environments for occupants – people, plants, animals and buildings. 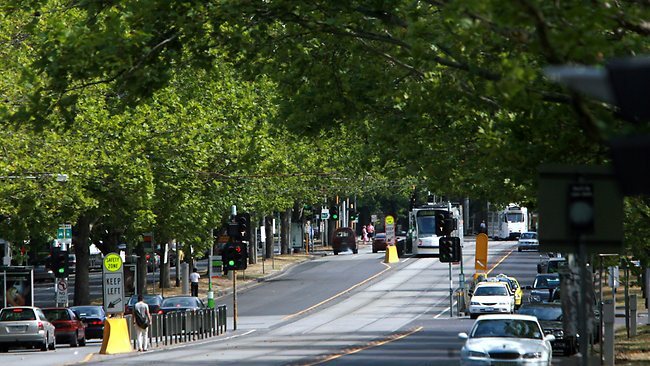 The City of Melbourne has a strong focus on street trees, with plans to increase the tree canopy coverage in the municipality from 22 per cent to 40 per cent by 2040 and increase tree diversity to improve resilience. A tangible way for street plantings and urban agriculture to gain wide acceptance is to support and implement social garden spaces in the city. The challenge for designers and communities is to develop exciting and innovative proposals for sustainable, community focused and activated places that will capture the imagination of the public, whilst cooling the urban space and providing access to locally grown foods. A recent town experiment in Todmorden, has placed the local English village and its community on the international map. Pam Warhurst cofounded Incredible Edible, an initiative dedicated to growing food locally by planting on unused land throughout the community. The concept has been so well received that the town has become a tourist mecca and now has an online video via TED to share the ideas behind the community led edible gardens. Emily Ballantyne-Brodie has co-designed a number of urban reforestation projects in Australia and Italy. Recent projects include The Docklands Community Garden and the Politecnico di Milano (Italy’s design University) Community Garden, alongside local community projects such as local food dinners and markets. As part of the Innate Ecology – Sustainable Living series, Emily will provide a two-hour workshop at 6pm Wednesday 13th Feb, Deakin University, Geelong. Emily will share a simple seven-step process to assist in designing urban gardens, local and regional community activities and action plans. Bookings can be made at http://www.InnateEcology/EventBrite.com.au.